Abbas is one of the estimated 2.5 million people worldwide living with Multiple Sclerosis (MS). Though some people call these patients "sufferers" of MS Abbas doesn't let her condition control her life. She wants to eliminate the word suffer and replace it "living with MS". When first diagnosed with the condition at the age of 23 she knew little about the disease. But now Bahrain-born Abbas has one mission in a region where MS is little-discussed. "When a patient here gets diagnosed I would love to provide them with a medical pack on how best to live with this condition. It is so important people realise that it's not just about taking medicine." In MS the immune system attacks the protective sheath (myelin) that covers nerve fibers. As a result this causes communication problems between the brain and the rest of the body. On Saturday Abbas launched the second edition of her education and awareness initiative 'MS Talks'. Hosted in a bid to spread the message to patients carers and families living with MS that they are not alone Abbas said it is important to attack the issue head on. "I was diagnosed quite young. When people ask me about my condition they ask me what medication I am taking.they think that's the only thing getting me through." Though medication helps control the condition Abbas said she is a huge advocate of diet and exercise. "This is what I want to get out to people. It's not a 'one size fits all' remedy but you can live so comfortably with MS by making simple lifestyle choices. It's you who is in the driving seat." Though statistics surrounding the number of MS patients in Dubai is not clear German Neuroscience Centre Dubai - which took part in Saturday's MS Talks to discuss the clinical aspects of living with MS - see about three patients a week living with the condition. "Awareness is really where I'm at. It was scary when I was first diagnosed. I googled MS and the information I found was horrible. It was a shock. I don't want others to go through that shock. 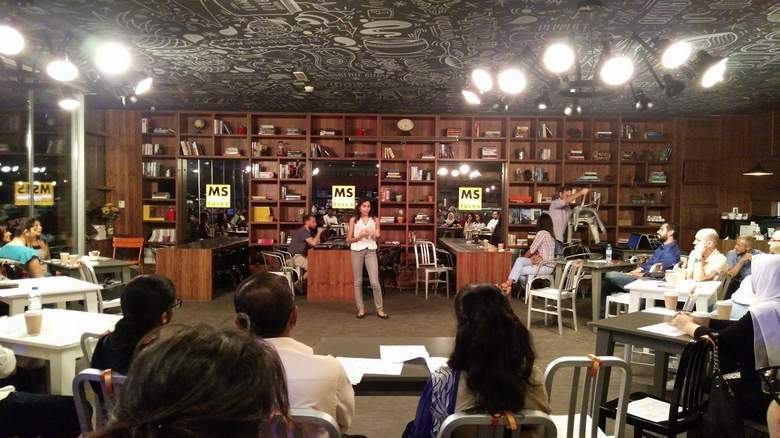 MS Talks is all about informing people that they are not alone." Growing up on a very traditional Arabic diet Abbas said initially the thought of cutting out foods like hummus and red meat was a "scary concept" but the changes it has brought to her life has been far from scary. "Will power plays a big role in controlling this condition but the end goal is so worth it. Stress can really aggravate it too so I find exercise helps relieve that tension." Since the MS Talks was first launched back in November 2015 Abbas has had interest from about 30 patients who want to know more. But healthcare professionals have also been in touch too. With two close friends living with the condition Sokhi said her interest in MS is personal not just professional. "My friend in Canada who lives with MS went from being very sick to practically-symptom free. She cleaned up her diet and it made such a difference to her life." Sokhi said it is important to cut out inflammatory foods like grains high-in salt foods and sugar and switch to a plant-based diet. "Overall I think MS patients should listen to their bodies and follow a diet that makes them feel better. They need to find the right balance of exercise diet and stress management along with their prescribed medications to manage their symptoms." Finding a doctor with "good knowledge of nutrition and supplements" or a nutritionist that can work with your doctor to come up with a protocol that best suits you is also key she said.